Virtualization is the creation of a virtual form of a computing resource like a computer, server, or other hardware component, or a software-based resource such as an operating system. The most common example of virtualization is partitioning a hard disk during OS installation, where the physical hard drive is split into multiple logical disks to provide better data storage and retrieval (a category known as 'data virtualization'). Of these, server virtualization is the most commonly used. Server virtualization involves pooling resources from one or more physical servers and partitioning them into multiple virtual servers. A special virtualization tool called hypervisor is used for this purpose. There are various types of hypervisors, such as type 1 hypervisors (”bare-metal hypervisors” that run directly on raw hardware, also called virtual machine virtualization) and type 2 hypervisors (hosted hypervisors that run on a guest OS). The key players in the type 1 market are VMware, Microsoft, and Citrix, while Red Hat's Kernel-based Virtual Machine (KVM) is the most widely used type 2 product. Gain better performance and efficiency from resources in the existing computing components, using CPU virtualization. Boost virtual machine (VM) security. Since VMs are logically separated from each other, a malware attack or other software glitch on one VM won't affect other VMs. Save money on hardware. Virtualization software involve less cost, and also require lesser hardware to run than physical machines. Gain peace of mind. VMs provide better reliability in terms of disaster recovery as well as better backup and retrieval capabilities. Discovering new VMs: Discovering and adding new VMs into a network can become tiresome, especially when you have to add credentials individually for each VM. This is where automated discovery comes in handy, since you can create multiple credentials and add all those devices at the same time. 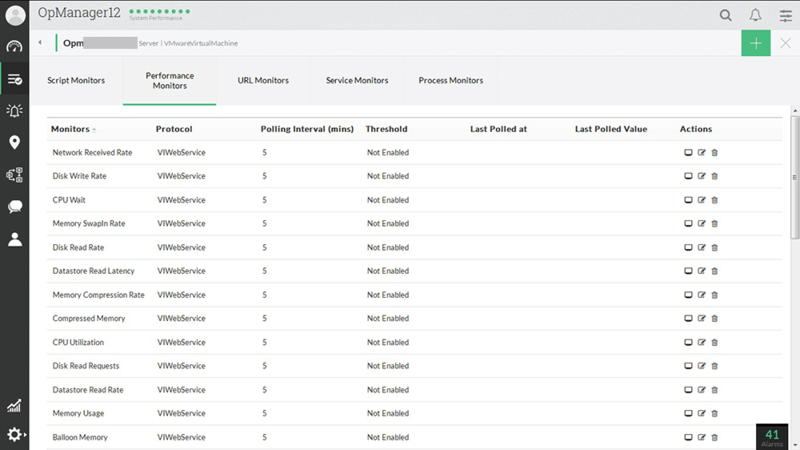 Some network management solutions even support one-click discovery, where once you add the vCenter or the corresponding hypervisor, all the VMs under it are auto-detected. VM sprawl: This happens when the number of VMs in an environment goes beyond a certain manageable number; VM sprawl can heavily affect the performance of your virtual devices. Unused VMs take up a lot of the virtualization server’s CPU and memory, resulting in lag or unresponsiveness in active VMs. VM sprawl can also open up security loopholes. Resource allocation: Allocation of memory and processing power for VMs should be properly planned beforehand and demands a strong understanding of how your network is growing. Over-allocated or under-allocated storage space for VMs not only heavily impacts performance, but also hinders the creation of new VMs in your environment when you run out of storage. Other than this, unused VMs or VM disk kernels must be constantly monitored and removed so that your network storage is optimized. Monitoring VM performance: Most network monitoring software doesn't support VM monitoring, and therefore requires a separate tool to serve that purpose. This further complicates the network and might result in devices being left unmonitored. An integrated VM monitoring solution will go a long way in helping you get the best performance out of your network. How will OpManager help me with virtualization management? 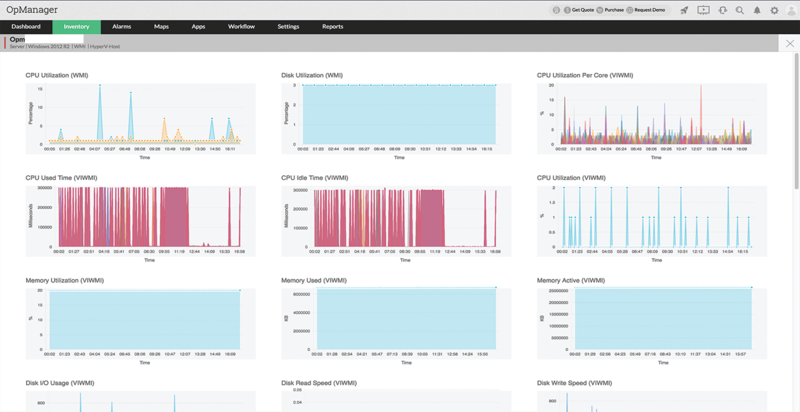 OpManager's extensive multi-vendor virtual monitoring environment helps you monitor and manage all your virtual devices with ease across three major vendors—VMware, Microsoft, and Citrix. With real-time monitoring, you'll know the status of your VM at all times, and also receive alerts when something isn't right. OpManager supports monitoring and management of Active Directory, SQL, and Exchange servers. The visualization summary tab lists all the info about your VMs on a single screen. You can see important stats related to VMs in your network, such as top hosts and top VMs in your network with respect to CPU utilization, memory utilization, disk usage, and network usage, across all vendors and devices. View the historical trend of a particular statistic using OpManager’s graphs. OpManager also displays the status of crucial device stats, such as CPU utilization and memory usage, over a period of time. OpManager also lets you set performance monitors for your VMs, and alerts you if there are any anomalies in the network. Set remedial measures as workflows for minor but frequent issues in your network. Automate basic functions of your VMs with workflows. With OpManager, you can execute functions such as Power on/off VM and Shut down/Standby Guest OS based on specific event triggers. Even better, you can easily create or modify your workflows using the drag-and-drop workflow builder. With OpManager's reports feature, you can watch trends in your network stats, and get meaningful insights on your network. Keep tabs on important stats like system health, availability, and performance, and better understand the relationship between your VM and your datastore/storage disk using dedicated datastore and disk mapping reports for VMs. Automate VM discovery and keep an eye on your VM's availability. Manage VMs in your network. Monitor VM performance in real time. Get detailed insights on your virtual devices using reports. Set workflows to automate specific VM-related actions. Get your free trial of OpManager to learn more about managing all your virtual network devices. Try it now!